Three intense, otherworldly novellas, each about a young woman for whom sleep is not a state of rest but an indication of spiritual malaise: the latest from Japan’s ever-popular Yoshimoto (Amrita, 1997, etc.). In the first, “Night and Night’s Travelers,” college-aged Shibami still reels from the accidental death of her older brother Yoshihiro, but her pain seems pale in comparison to that of her cousin Mari, who was Yoshihiro’s lover and confidante. Wholly incapacitated by his death, Mari moved into Shibami’s house and Yoshihiro’s room, becoming a part of his family for nearly a year until her grief subsided. When she appears outside Shibami’s window one snowy night, however, barefoot and wraithlike, the time has come for the truth about Yoshihiro’s other girlfriend, the American Sarah, with whom he moved to Boston and without whom he returned to Japan. “Voyage to the House of Sleep” charts a different course through grief as a hard-drinking woman, before she plunges into sleep, hears eerie music—sounds that her boyfriend identifies as a call from the dead. Sure enough, a woman the drinker once knew as a rival for the affections of another man has died—drunk herself to death, in fact—and, with the help of her boyfriend and a midget medium, the two women make contact, if only to explain that although they treated each other abominably, they were also friends and could have been more than just that. The title story features a woman who sleeps more and more in an effort to escape from joblessness, the death of her closest friend, and the fact that her boyfriend’s wife is in a coma, unlikely to awaken. Only a dreamlike encounter with that wife, who tells her to go out and get a job, frees her from her lethargy and allows her to resume a normal life. 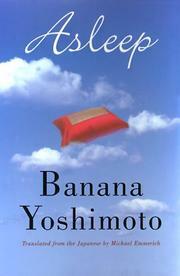 Astute, darkly atmospheric, and charged with the uncanny: Yoshimoto’s best in quite a while.